Tilda Swinton – I realized this month that Tilda Swinton is the common link shared by many of my favorite horror movies: Only Lovers Left Alive, Suspiria, and We Need to Talk About Kevin. She is extremely talented and versatile! Cozy Mystery Audiobooks – I adore the fun, lighthearted nature of cozy mysteries where you get to solve a murder alongside an amateur sleuth and a cast of colorful characters set against an endearing, small-town backdrop. 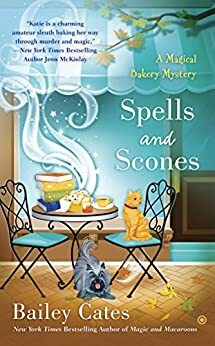 Lately, I’ve been making my way through the Magical Bakery series by Bailey Cates and the Needlecraft Mysteries by Monica Ferris. Knitting – Even though warmer weather is creeping in, I’m still knitting away to create hats and scarves for the homeless through the charity Warm Up Ohio. It’s both relaxing and rewarding! Kindle Paperwhite – While I love my Kindle Fire, the e-ink screen of the Kindle Paperwhite makes it so much easier on the eyes to read for long periods of time. It’s also so thin and portable that it will squeeze into even my smallest purse – because I obviously need to be connected to my library at all times!